Echuca Moama Artists present ‘Scribbler on High’ featuring a collection of Art Deco paintings by Veronica Lamb and contemporary textile art in vibrant colours by Valerie Hill. The exhibition will be on show through to Saturday 30 March. Isobel Harvey's 'Remember When Exhibition' featuring a meander through the ages is currently on display at Kyabram Town Hall Gallery. Entry to the ‘Remember When Exhibition’ is $8.00 adults, $6.00 conc. and $10.00 family. Kyabram Town Hall Gallery is open daily 10am to 4pm (except Sundays). Also on display is ‘Wild Exposure’ by Felicity Johnson and ‘A Survey’ by Splinter Contemporary Artists. The exhibitions will be on show through to March. What Kids did for Fun is an exhibition of the Echuca Historical Society Museum. The focus of the exhibition is connecting today’s kids to the yesteryears of their parents and grandparents and engaging families with their history. The exhibition is on at Echuca Historical Society Museum until 23rd February 2019. The Museum is open 11am till 3pm, 7 days per week. 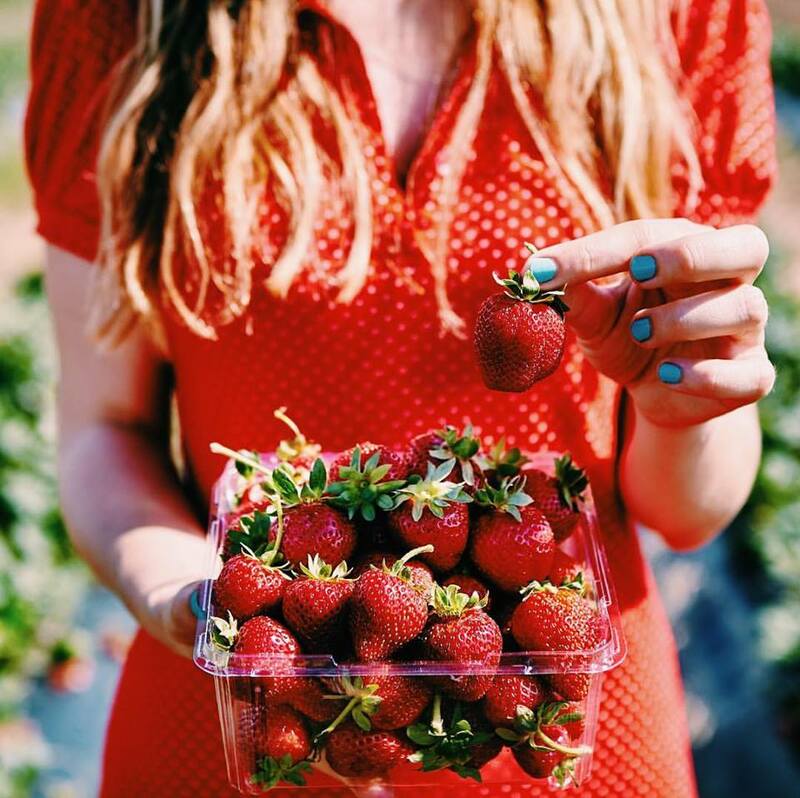 Enjoy a unique ‘Pick Your Own’ Strawberry Experience, only 10 mins from Echuca. Fresh country air, delicious strawberries and some special memories created with your loved ones. Select premium strawberries straight from the plant and indulge in some sorbet, ice cream or traditional scones with jam and cream. For the first time, Kyla Kirkpatrick is teaming up with her winemaker & sommelier partner, Kyri Christodoulou, to bring you their brand new show, Behind the Bubble. Together, Kyla and Kyri will de-mystify champagne and the industry that surrounds it. Take a look as they pull back the curtain on the lesser-known world of our favourite bubbly and provide the answers everyone wants to know. From how it is made, to the terroirs on which the grapes are grown, these champagne experts will take you Behind the Bubble to uncover the science, the secrets and mystery of the drink we all love. Tickets $149.00, including 5 champagnes and light food over a two hour masterclass. Saturday 9th February from 3pm to 5pm at Junction Moama. Jessica Lorraine will be performing live from 1pm to 4pm Saturday. Kim Kneebone will be performing live from 1pm to 4pm Sunday. A relaxing dining and/or picnic area are located adjacent to the river, perfect for family gatherings or catch ups with your best group of mates. The kids (big and small) can enjoy games and you can also bring your pet along. Wood fired pizzas are on our menu along with generous cheese platters and dip plates, or if you prefer you can bring your own picnic lunch (no BYO alcohol is permitted). Courtesy bus available for groups of 10. Speedway action returns to the Heartland Raceway on Saturday 9 February with the All Star Sprintcars, SDAV Hot Rods (Legends Cup), VSC Open Sedans and V8 Dirt Modifieds. Public gates open at 4pm with on track action beginning at 6pm. Full canteen and bar facilities available, No BYO alcohol. Prices: Adults $25.00, Pensioner $20.00, Youth (11-16) $10.00, Child (5-11) $5.00. No EFTPOS available at the track. Stand-up comedy is coming to the barrel room at The Shiraz Republic. The Wine Science Show by Luke Morris - Laugh and learn with Guests Luka Muller, Eve Ellenbogan and Zack Dyer. Saturday 9 February - Comedy Show from 7.30pm to 9.30pm, food available from 6pm. Live music continues at the Shiraz Republic on Sunday 10 February with Vintage Blues featuring Sons of the Blues and Ben J Carter. Hailing from Castlemaine, Sons of The Blues comprises Patrick Byrne on vocals, guitar and stomp box, and John Phillips on lead guitar. You can expect great food, great wines and great beer to relax and enjoy the spacious cellar door. Make use of free pool tables, inside and out and plenty of picnic tables & couches. Three’s a Crowd are performing live at the Rich River Golf Club from 8.00pm Saturday. Bistro, Bar, Café and kids play room. Enjoy a delicious meal in air conditioned comfort. Courtesy Bus bookings are available. A variety of produce and quirky crafts are available from the Girgarre Farmers Produce and Craft Market. The market runs from 8.30am to 12.00noon on Sunday.